Go on admit it! The ancient Tarot has a fascination to us all and hard to resist. Many famous diviners have used the Tarot to predict events as have fairground gypsies over centuries. Now you can learn it both to help yourself and astonish your friends -and maybe become a professional yourself! 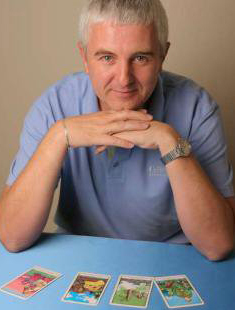 Tim is a full-time professional Tarot Reader and a Moderator for TABI (Tarot Association of the British Isles) and a Tarot Professionals ACE (Accredited & Certified Excellence). He has developed psychically over many years including several mediumistic development courses with the JCPF. Tim teaches the Rider Waite pack, a highly-respected set used widely by professional tarot readers. This programme literally starts at the beginning as to what a Tarot pack is, what divination is all about and the origins of the Tarot. Then week by week, over two six-week courses, you we go through the meanings of all 78 cards and from the second week of the first course you will start doing readings for yourself, as a class and in pairs for other students. You will learn how to do 3 card spreads and the classic 10 card Celtic Cross spread. Tim provides a week by week workbook that takes you through the first two six-week courses, with in-depth advice on the meanings and uses of all the cards, including for example, basic numerology and how to phrase a question. You don’t have to sign up for both 6-week courses, but 95% of students do! And if you want to get ahead of the game -take that workbook to bed with you! The Intermediate course puts the polish on what you know and deepens your understanding. It introduces and teaches the reverse meanings and interpretations of the cards. And thanks to the workbook you can get a head start on that! There are a whole set of new and expanded spreads to learn and practice, namely "The A to B spread"; an expanded Celtic Cross using a summary card; "Shadow spreads", that to look into past lives and a huge 34 card "12-month forecast spread", which you won't find in any books that we are aware of. The Intermediate Course takes you deeper into the personal self-development areas of Tarot and links in with the Hermetic Qabalah and the Astrological symbolism hidden in each card. You will be learning at a much deeper level and with a variety of spreads to choose from. Upon conclusion of this course you will feel confident in reading for yourself and from whomever wants a reading from you. Students who complete the course will be presented with quality assurance certificates. The Intermediate course is also suitable for those readers out there who have a good knowledge of the RWS cards but are either a bit rusty or wish to extend their knowledge, particularly with reversed cards and more complicated spreads. Tim is also prepared to provide one-to-one coaching sessions to students on course or between courses and if you are serious about practising professionally -Tim conducts Advanced Master classes. I have completed the beginner's course. Tim was supportive and a professional teacher I will be signing up for the next course . Having completed the beginners and intermediate courses with Tim through JCPF. I have learnt the tarot, Tim is supportive and explains anything with tact and patience. Great teacher with a wealth of experience.